Exactly four years ago I was travelling in southern Spain. 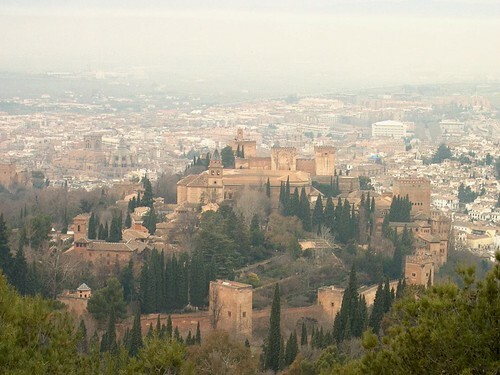 I first visited Granada with my mother and her fiance but after a couple days we had to leave. I loved that city so after they left I inexplicably wanted to return. I did, found a great hostel and had a wonderful time. On my last day there, before I went to Morocco I met an Argentinian woman called Pato. We hit it off right away, and had a wonderful, albiet brief, time together. We exchanged emails over the years, but after a while it slowed as we were living in different hemispheres and had little opportunity to reunite. When Tyler and I started this trip I wrote to Pato to let her know I was finally on my way to her country. But, to my dismay, the email bounced and I had no way of getting in touch with her. Dissappointed, Tyler and I continued our trek south. A few weeks ago, in Bolivia preparing for our entrance in Argentina, she wrote to me out of the blue to say hi from her home in Buenas Aires. I wrote back immediately with the news that we were closer to eachother than we'd been in four years. Tyler and I were heading towards Jujuy, a provence in the north and oddly she was simultaneously plotting a camping trip to Jujuy with two girlfriends. It all was an outrageous coincidence, like something out of Hollywood movie. After a flurry of emails we chose a spot to remeet and I spent the next couple weeks in anxious anticipation. I tried hard not to expect too much, and get my hopes up, but failed miserably. Tyler and I spent our first day in Argentina on a succession of long busrides so we could make it in time to meet her; finally arriving in Salta in the middle of the night. I got up early to meet her bus in the morning and was dazzled. Over the next few days I realized that my expectations were overblown and awry. She is a lot different than I remembered, she is better. I got a new travel partner and lost another. Throughout this whole trip we've been vaguely planning on making it to the southern tip of Argentina, the continent and the world. But Pato was planning on staying in the Jujuy to travel with her friends and having just remet her I was in no hurry to leave once again. Tyler, on the other hand, has his heart set on the penguins and glaciers in the south. So having spent more time together than most newlyweds we decided to part ways. We've seperated before, in Nicaragua, but for less time. Although I love my brother, and would do anything for him, spending so much time together (7+ months, almost always sharing our days) has inevitably led to small frusterations and annoyances. We still have a great time together, and look forward to a lot more, but both of us started craving a little space. Also, curiously, this seperation helps us both answer some questions we started this trip with. The very first post on this blog was written by Tyler describing our differences and what we hoped to learn down here. I've spent my adulthood travelling around the world fully connecting with little. Tyler, in turn, spent his former life almost never leaving Albany partly because he was happily together with a girl. We hoped this trip would help us learn from the other how to be more fully balanced. And now, independently, Tyler decided to give his wanderlust full reign and make a mad dash alone for the southern tip of the world. And I've chosen to spend the majority of my remaining time in one of the tiniest provences of Argentina because of wonderful girl. Only James Blunt could... "You're Beautiful... its true". I miss you terribly... only a week apart, and I've already forgotten what any of those annoyances were about. At any rate... I'm looking forward to seeing you in the big city. Make sure the lovely Pato knows that your first love will be be steaming into town with a vengence... and wants bailando y bebiendo!!! By the way both yours and Ty's addresses bounced. Please help! hey micah what a great blog and what a marvellous story, really happy for you chappy I hope your remaining time in southamerica is enuff for you happy couple, COngrats!!!!!!!!!!!! What a wonderful story Micah! and turn of events. Now that you are separated we need to hear more from you Tyler. We are all looking forward to going to the ends of the earth with you.